About half of the group competing in the Mega Team Form. The rest of the group competing in the Mega Team Form. 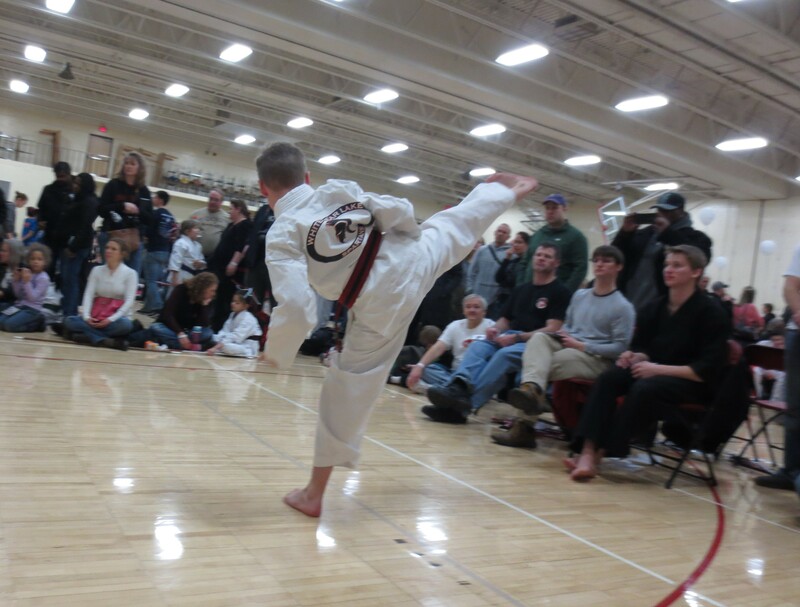 A few weeks ago, my son attended the Twin Cities Rumble karate tournament. 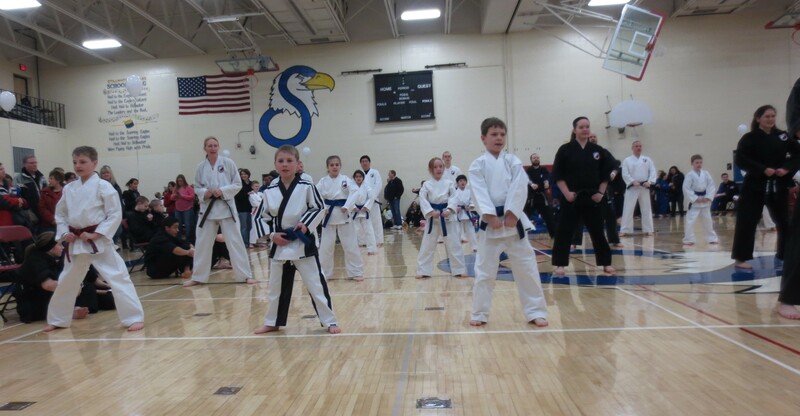 This was the first tournament that Forte’s Karate was part of the production (behind the scenes). It was also the first tournament where they did a Mega Team Form. The youngest member of the team form was about 7, the oldest were in their 40’s. It was very fun to watch this huge group consisting of children, some of their parents, and even three of the teachers compete together. For their first time doing this, I thought they looked very good! They were quite together. They took 2nd place. Several members of Team Forte with their 2nd place trophy. After the Team form, we had a LOOONG wait until Michael had to compete again. The Team Forms were first at about 9:30 -10. 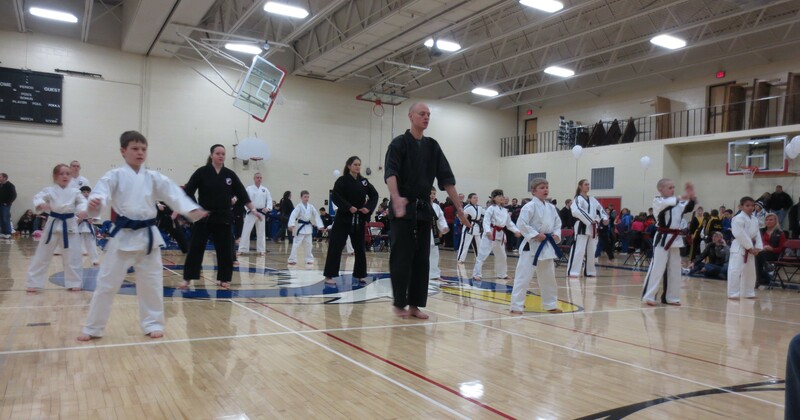 The black belts go first, so they are ready to judge when they are done… It’s always fun watching them compete – there are some amazing competitors in the circuit! We always look forward to watching Mr. Hallberg spar! Michael was supposed to compete shortly after 1, I think it was at least 2:30 (if not later) before his division went. I know we were one of the very last groups there, and weren’t done until close to 4:30 or 5. 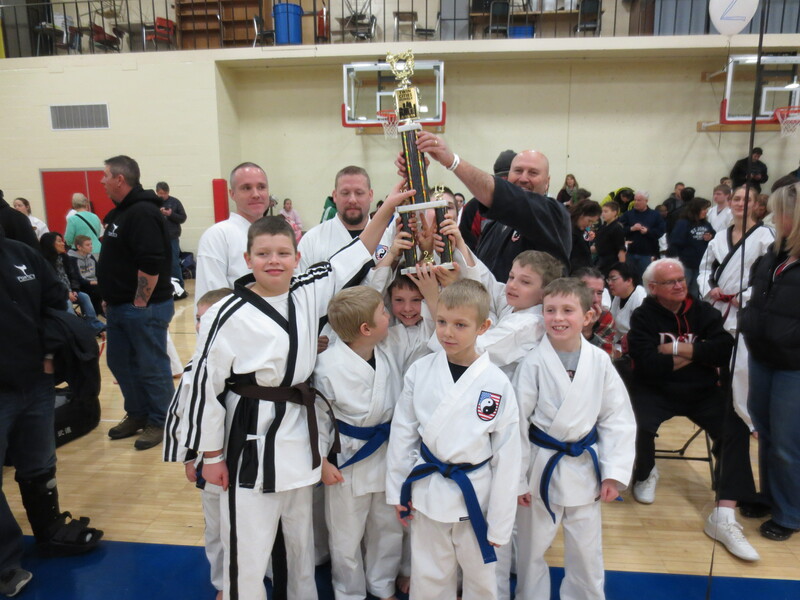 Jacob, Mason, and Michael, three red-brown belts, ages 8-9, from the same school, competing in the same form division. 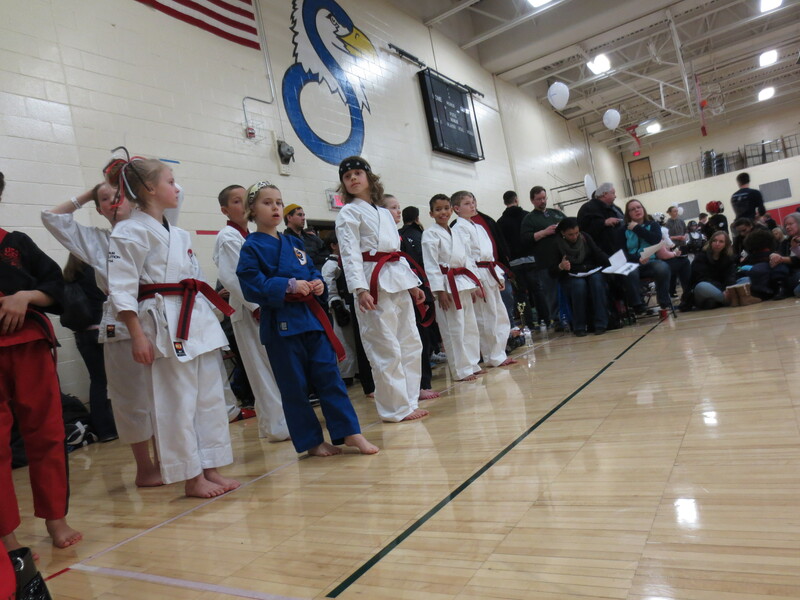 My son’s division is pretty large, 8-9 year old red/brown belts. Michael had just graduated to brown belt, a week or so before the tournament. Because he had already been registered as an advanced red belt, he competed as advanced red. There are very few brown belts in this division, and because it’s red/brown, it didn’t affect where he would compete. It’s always interesting to watch when kids from our school are competing against each other. In Michael’s age group, there were three. They cheer for each other, but are also trying to win. At the same time, they don’t care when they are beat by a team mate. They are proud of each other’s accomplishments! It makes me feel proud of them to see the great sportsmanship! 🙂 Michael doesn’t really care what he gets. He just has fun competing. Michael’s kicks amaze me, every time! Michael did a different form than the other two boys. He was nervous, and he rushed it a bit. His technique is great, he just needs those reminders to slow down, breathe, yell, and do what he knows how to do. That advice can’t come from a parent! 😉 Michael got a medal for being a finalist in form. He didn’t place in the top 4, oh well. His team mates took 2nd and 4th. They usually end up having to split this large group, at least for sparring. I almost think there would be enough to just have 8 year olds in one ring, and 9 year olds in another. They’d probably still have to split those 9 year olds! Another way they could split them would be to split red and advance red/brown belts. When they split them for sparring, they try to make sure kids from the same school don’t end up going against each other. Occasionally, it does happen, but they try to split them. Michael did great in sparring! He won his first match. There are two boys from Team Edge that tend to be the ones he goes against for first place. The scores are always close, and the matches could go either way. While they are always good matches, Michael usually ends up taking 2nd. The parents of both Team Edge boys are great! We always chat, and they are great promoters of sportsmanship with their competitors. As mentioned above, it ended up being a long day! Registration was kind of a mess. At the time team forms were supposed to be starting, there was still a looong line of competitors waiting to sign waivers and get their admission bracelets. In addition to the participants, were all the spectators… Most of the participants were already registered ahead of time. I’m not sure why waivers weren’t part of the registration process. For dance competitions, a waiver is often sent to the dance studio ahead of time for parents to sign. For the one coming up, for example, a waiver containing a list of participants was sent to studio, and parents had to sign on the line for their student. For other karate tournaments my son has participated in, bracelets were sent ahead of time, speeding up the registration at the door of the event. Being that this was the first time this particular group has put on this tournament together, I’m sure they learned a few things to do differently, and will improve for next time. I have been a part of putting on large events, and the bummer is when these snafus happen, especially at registration, and scare away potential future participants. What I really appreciated at the end of the day, was when they split up the group for sparring, they moved our group to another ring. One of the organizers came over apologizing for the long delay. He thanked us for staying, and for our patience. It sounds like there were many contributing factors to the limited use of all the rings they had set up, including that some of the people they were expecting to judge during the day left, instead of staying to judge. In addition to that, they had many more competitors than they originally expected. You can see the problem these two factors together can create.We were very thankful for those that stayed and worked very hard judging and trying to get through all the groups as quickly as possible.